Your carotid arteries carry blood to the brain. 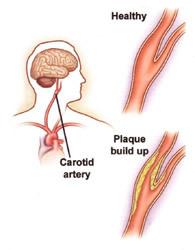 Plaque can build up inside these arteries, affecting blood flow, which can lead to a stroke. Your doctor is recommending testing and treatment to reduce the risk of a stroke. A stroke is brain damage caused by lack of blood flow, the results of which can be very serious. A stroke can cause severe disability, including paralysis, difficulty speaking, and trouble doing simple tasks. Some strokes can be fatal. A warning sign of a stroke is a transient ischemic attack (TIA). It has the same symptoms as a stroke, but the symptoms go away within minutes or hours, and there is no permanent damage to the brain. Having a TIA is a sign that you are at increased risk of a stroke. Paralysis or weakness on one side of your body. Numbness or tingling on one side of your body. Drooping of one side of your face. Carotid endarterectomy – open surgery to remove plaque from the artery. 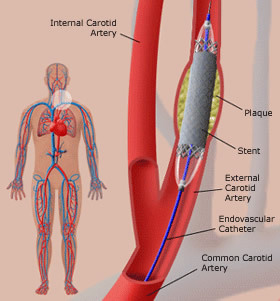 Carotid artery stenting – a minimally invasive procedure to improve the blood flow. The brain needs a steady supply of blood to work. Problems with the vessels that supply the blood to the brain can block blood flow. When this happens, parts of the brain become starved of oxygen and nutrients. This damages the affected area of the brain, which can impair certain body functions. The heart pumps blood throughout the body. Arteries carry blood to limbs and organs, including the brain. 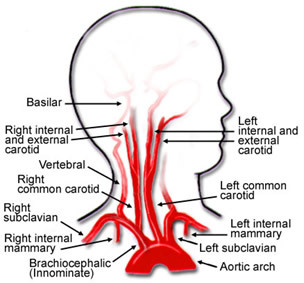 The carotid arteries are two of the main pathways for blood to travel to the brain. The two common carotid arteries travel up one side of the neck. Each common carotid artery divides into two branches – the internal carotid artery, which carries blood to the brain, and the external carotid artery, which supplies blood to the face and scalp. When the carotid arteries are healthy, the artery walls are smooth. They are open and allow blood to flow freely to the brain, which allows the brain to get all the blood it needs to function. Arteries can become damaged due to risk factors, including smoking, diabetes, and hypertension. Family history also makes some people more prone to artery damage. The damaged artery no longer has a smooth lining. Cholesterol and other particles in the blood attach to the artery wall and form plaque. A buildup of this plaque leads to stenosis or narrowing of the artery. This can reduce blood flow to the brain. The surface of plaque may be rough and blood can collect there and form clots. The plaque can rupture and enter the bloodstream. Rupture can also produce more blood clots. Fragments of plaque and tiny blood clots, also called emboli, then travel to and block the smaller artery in the brain. This cuts off the blood flow to a portion of the brain, resulting in a stroke. When the blood flow is cut off, brain tissue can die, resulting in loss of brain function, the results of which cause difficulty speaking or controlling movement. Exact symptoms depend on which part of the brain is affected. Symptoms often occur on one side of the body (the opposite side of the blockage). A stroke does permanent damage and can cause long-lasting loss of function. A TIA is a short episode of stroke-like symptoms, sometimes called a “mini-stroke”. TIA symptoms go away within 24 hours, but otherwise, they are exactly the same as stroke symptoms. If you have stroke symptoms, DO NOT waste time wondering whether you are having a TIA. Call 911 right away. An evaluation by your doctor can give him the answers as to the severity of your carotid artery disease and the right treatment for you. This includes a medical history, examination, ultrasound imaging, and, in some cases, other imaging tests (see below). Ultrasound: An ultrasound is a non-invasive test. The technician uses sound waves to create images. An ultrasound checks for stenoses in the carotid arteries and how the stenoses affect blood flow through the arteries. The results of this test can indicate whether an artery is narrowed enough to warrant treatment. An ultrasound may be the only imaging study you need. CT (computed tomography): A series of x‑rays are taken with a special x‑ray machine. Computers use these x‑rays to create 3-dimensional images. For CT angiography (CTA), contrast (x‑ray dye) may be injected to help arteries show up clearly. MRI (magnetic resonance imaging): This test uses a strong magnet to create detailed images of the body. A different type of contrast fluid may be used to highlight the arteries. Angiography: This is performed using a catheter inserted into an artery in the groin. Contrast fluid is then injected through the catheter into the carotid artery and x‑rays (angiograms) are taken. Two procedures are available to treat carotid artery disease – carotid endarterectomy and carotid stenting. Your doctor will advise you which procedure is best for you. 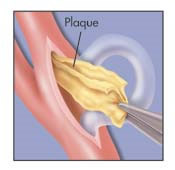 Carotid endarterectomy (see below): An incision is made in the skin over the artery. The artery is then opened and the plaque is removed. A shunt may be used to preserve blood flow to the brain during the procedure. In some cases, a shunt is not necessary because the brain is getting enough blood through other arteries. The incision in the artery and skin are then closed, either with sutures or a patch. Carotid artery stenting (see below): Stenting is placement of a wire mesh tube (stent) in the carotid artery to hold it open. A catheter is used to place the stent in the artery. The procedure is performed using local anesthesia. The skin in the area of the insertion site is numbed with local anesthesia. A puncture is made in the femoral artery in the groin. An introducing sheath (tube) is inserted into the puncture. This tube remains in place throughout the procedure. The catheter is then inserted into the sheath. Using x‑rays as a guide, your doctor moves the catheter up the aorta, behind the heart, and to the carotid. An angiogram of the carotid artery is taken. Placing the filter – A filter catches fragments of plaque that may break off, which prevents them from flowing into the brain and causing a stroke. The catheter is used to place the filter in the artery and advance it past the stenosis. The filter is then opened. It remains in place for the entire procedure. If the narrowing is very severe, the artery may need to be widened before the filter is put in place. Opening the Artery – A tiny balloon is used to expand the narrowed artery, which is called balloon angioplasty. The uninflated balloon is first moved to the area that is to be widened. The balloon is inflated, which opens up the space inside the artery. You will most likely not feel any pain when this is done. Afterwards, the balloon is deflated and removed. Placing the Stent – A carotid artery stent is a flexible wire mesh tube. It may be the same width at the top and bottom or it may be tapered. Once in the artery, it remains there for life. The most common stent is designed to resist pressure and crushing. This helps it adjust when you move your head and neck. The stent is advanced to the site of the plaque. When released, the stent expands until it touches the surface of the plaque. Balloon angioplasty is used to expand the stent fully and widen the artery. The balloon is then withdrawn, leaving the stent in place to hold the artery open. Finishing the Procedure – An angiogram is then taken again and compared to the angiogram taken at the beginning. This is done to check on the success of the procedure. Once your doctor is satisfied, the filter and other instruments are withdrawn and the groin insertion site is closed. Temporary or permanent hoarseness, numbness, or swallowing problems. Blood clot in treated vessel. Preparing for Your Treatment – You will be told how to prepare for the procedure your surgeon will perform. This can include special instructions about medications. Be sure to follow all of your doctor’s instructions as you prepare. Tell your doctor about all of the medications you take, including over‑the‑counter medications, herbs, and supplements. Make medication changes as directed by your doctor. You may be told to stop certain medications that you normally take. You may also be told to start taking certain medications before surgery. Arrange for a ride home when your hospital recovery is finished. Do not eat or drink after midnight the night before your procedure. Ask your doctor whether you should take medications during this period. Follow any other instructions from your doctor. On the day of your procedure, when you arrive at the hospital, you will change into a hospital gown. The hospital staff will prepare you for your procedure. An intravenous line will be started to provide you with fluids and medications. You will then be taken to the room where the surgery or stenting procedure will be performed. During your hospital stay, you will receive pain medication to control your pain, if you need it. You will also be monitored and you may have certain tests. If you have a drain in place, it will be removed before you leave the hospital. After either procedure, you will most likely stay 1 or 2 days in the hospital. Your recovery at home should take about a week. After you have recovered, be sure to follow your doctor’s instructions for follow‑up. Your doctor can advise you on ways to improve the health of your blood vessels and your whole body. Take it easy, but also get back to your normal routine as much as possible. You can expect to be back to your usual activities in about a week. Keep your neck incision or the groin puncture site clean and dry. Avoid lifting anything over 10 pounds for about a week. Do not drive until your doctor says you can. If you had an endarterectomy, shave carefully around the incision. Consider using an electric razor. If you had stenting, shower instead of taking a tub bath for a few days. You have problems at the incision site or puncture site, such as swelling, redness, warmth, and/or increasing pain. You have a cold or painful leg or foot (after stenting). You experience mental confusion or headaches. After the procedure, you will have a follow‑up exam and tests. Ultrasounds or other imaging tests may be needed regularly from now on. Restenosis (re-narrowing of the artery) is not common after either treatment, but does sometime occur. If so, you may need to have another procedure. The same factors that put you at risk of stroke also put you at risk of other health problems, including heart disease, kidney problems, and other types of arterial disease. Lifestyle changes and medications can help treat these risk factors and keep you healthier. Exercise regularly. A common goal is to exercise 30 minutes or more a day, most days. Talk to your doctor before starting any exercise program. Choose healthier foods. Include more vegetables, fruits, whole grains, and low-fat dairy products in your diet. Also, cut back on animal fats, sweets, and processed food. A dietician can help you learn more. Quit smoking. Smoking increases the risk of blood clots and increases blood pressure. Talk to your doctor about how to quit for good. Take medications as directed. You may be prescribed medications to help control blood cholesterol, diabetes, and hypertension. Controlling these problems helps keep your arteries healthier. You may also be prescribed medications to prevent blood clots. Look toward the future – Treatment for carotid artery stenosis can reduce your risk of stroke, but the conditions that led to the problem may still exist. Talk to your doctor about what you can do to improve the health of your arteries and your overall health.